In a weird way, wind turbines are taking us back to the days when Archie Bunker-attitudes were prevalent and white homeowners feared that the arrival of colored folks would send real estate values plummeting. You know: There goes the neighborhood! Only now it’s not race but big spinny things that are getting some people worked up. A survey of research into wind turbines’ effects on home values by the National Association of Realtors last year seemed to find little evidence of a big impact, but that hasn’t stopped the anti-wind power forces from trying to whip up fears of values going into the toilet. Typically – as in this story – they point to small-scale studies of questionable methodology. Into this morass comes a new Lawrence Berkeley National Laboratory analysis of data from 27 counties across nine states, taking in 50,000 sales within 10 miles of 67 wind farms and nearly 1,200 sales within a mile of turbines. The verdict: stop your worrying. We find no statistical evidence that home values near turbines were affected in the post-construction or post-announcement/pre-construction periods. Previous research on potentially analogous disamenities (e.g., high-voltage transmission lines, roads) suggests that the property-value effect of wind turbines is likely to be small, on average, if it is present at all, potentially helping to explain why no evidence of an effect was found in the present research. Based on that, it looks like in U.S. at least, the idea of wind turbines ruining the resale value of large swaths of housing is about as scientifically valid as wind turbine syndrome. 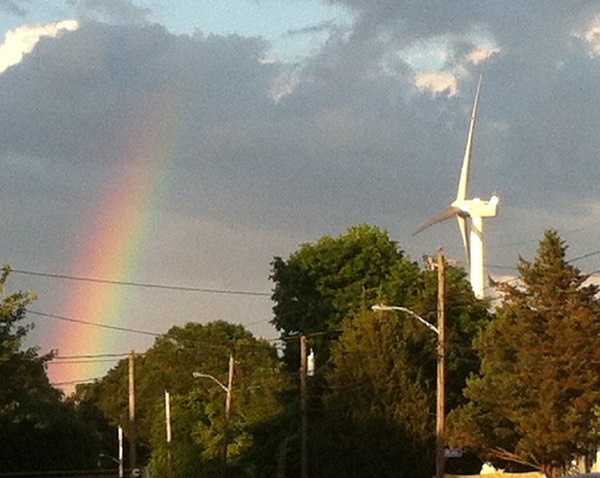 Oh, and by the way: this, one kid’s opinion of wind turbines near her home. “A Spatial Hedonic Analysis of the Effects of Wind Energy Facilities on Surrounding Property Values in the United States” is available online as a 58-page PDF. The above study is good and the findings good. However all wind turbines are not the same. Vertical Axis turbines for small off-grid operations, are almost soundless, unless you are use to walking into tree trunks, safe, and easy to fix if in need of maintenance. They are coming to residence near you! They by the way work well in omni-directional-turbulent low velocity (low Reynolds number flow) winds and do not need high-speed brakes as at designed-to high speed aerodynamically stall out (do not turn). As a RD&T engineer on these systems they are bound to go into the market place. I just have to ask Pete Danko. How many of these 500 foot monstrosities do you have surrounding your home? I’ve met people who are surrounded by wind turbine facilities. They can’t sell their properties. No one wants to live in the middle of an industrial electrical field. When people buy homes in the country, it’s for the view and the tranquility and the peace and quiet. You don’t get any of that when you have 50 storey electricity generators as far as the eye can see. Common sense tells you this story is B.S. I just have to ask if we PAY nuclear not produce or sell Nuclear off at a loss or charge 6.7 cents per KWH when it costs 29 cents per KWH “ALL IN”, why do we spend BILLIONS AND BILLIONS on Nuclear? ?